Tell me what reader hasn’t felt like this before. This entry was posted in awesomeness, extra further randomness, reading. Bookmark the permalink. Not me. I never look at the last page. Oh yes, I'm so good like that. EH: No, I guess it's probably not that surprising. LOL. is someone trying to tell me something?? I've looked 😦 Print books are easy though. I'm been freaking out over my current fantasy read. The author (I'm reading through a GoodReads group) has told me to have faith. She doesn't do 'no hope'. PHEW! I nearly looked when reading Keeping Promise Rock! Orannia: It is SOOOO much easier to skip in print than it is in eformat. That is both a good and bad thing about reading so many ebooks. LOL. No go on the audiobooks…. 😦 And I have wanted to. I totally look… all the time. I HATE surprises! 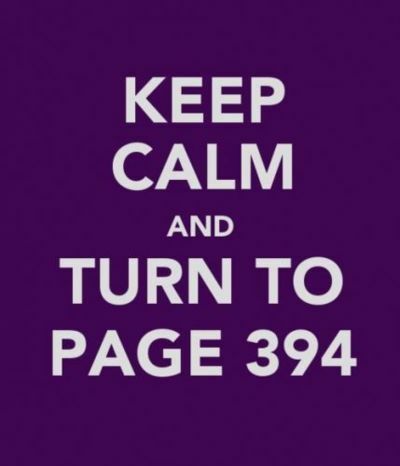 I never read excerpts or spoilers or peek at the last page. Sometimes I even get mad at blurbs for giving too much away.